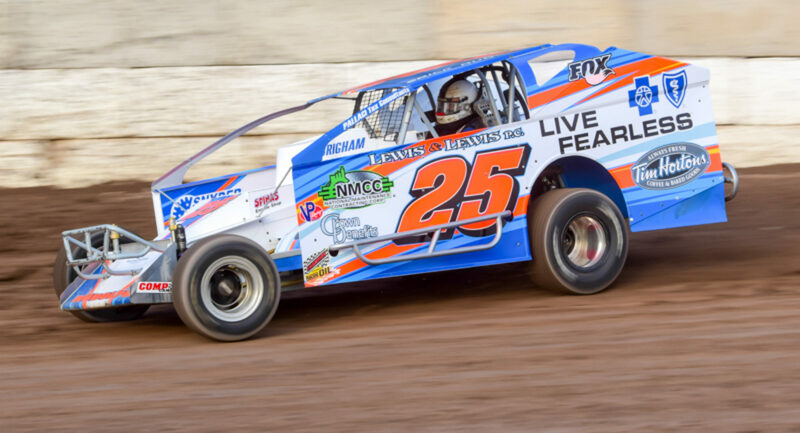 SYRACUSE, NY – Erick Rudolph raced to victory Saturday night before a large and enthusiastic crowd in the Indoor Auto Racing Series Three Quarter (TQ} Midget 40-lap feature inside the Syracuse Exposition Center on the New York State Fairgrounds. Rudolph held off surprising Mike Bednar in the run to the checkered with Tommy Catalano, Andy Jankowiak and Eddie Strada completing the top five. Bednar passed Catalano for second on the final lap while Jankowiak suffered a flat left rear tire while contending for the lead early in the race. Strada started in the 12th row at the start and picked his way to a fifth place effort. A spectacular accident at the midway point of the race saw Matt Janisch and Justin Bonsignore slam into the second turn fence while fighting for third place. Janisch flipped wildly while Bonsignore’s car ground to a halt against the concrete. Remarkably, Janisch was able to return to finish ninth; Bonsignore who had been a championship title contender was officially scored 19th. Tyler Brown won the 20-lap Champ Kart feature over Todd Crenshaw, JJ Pacovich, Ryan Kendall and Brandon Rusczek. The Slingshot 20-lap main event was claimed by Louden Reimert who fought through heavy lapped traffic to shade Cody Kohler, Danny Buccafusca, Kurt Bettler, and Austin Silfee. In Saturday afternoon TQ Midget group time trials, Andy Jankowiak set fast time over Erick Rudolph, Scott Kreutter, Briggs Danner, Justin Bonsignore and Tim Buckwalter. Forty-nine drivers made runs against the clock. The four TQ heats were won by Jankowiak, Rudolph, Kreutter and Anthony Sesely. The two B-Mains were won by Lou Cicconi, Jr. and Marc Johnson. In Champ Kart preliminary race action, JJ Pacovich, Mike Perry and Dan Marsden were the winners of the heat races and Jake Nelke won the sole B Main. Slingshot heat races were claimed by Louden Reimert, Danny Buccafusca and Austin Silfee. The race-within-the-race, the Indoor Auto Racing Series Fueled By VP Racing Fuels 2019 season championships were decided this night. Eight TQ Midget drivers, six Champ Kart competitors and 12 Slingshot hopefuls came into the finale with a mathematical chance to win the coveted titles. Erick Rudolph won the TQ title, his fourth for himself and car owner Mark Lafler. Andy Jankowiak was second in the final rundown with defending Series champion Justin Bonsignore third and teammates Eddie Strada and Matt Janisch fourth and fifth. TQ Midget Feature (40 Laps): 1. Erick Rudolph, 2. Mike Bednar, 3. Tommy Catalano, 4. Andy Jankowiak, 5. Eddie Strada, 6. Anthony Sesely, 7. Earl Paules, 8. John Ivy, 9. Matt Janisch, 10. Tim Buckwalter, 11. Jeremy Haudricourt, 12. Timmy Solomito, 13. Briggs Danner, 14. Joey Payne, 15. Ryan Tidman, 16. Shawn Nye, 17. Patrick Emerling, 18. Scott Kreutter, 19. Justin Bonsignore, 20. Jonathan Reid, 21. Marc Johnson, 22. Lou Cicconi, Jr., 23. Anthony Payne, 24. Tim Nye. Final Series TQ Points (Top Five): 1. Erick Rudolph 450, 2. Andy Jankowiak 380, 3. Justin Bonsignore 371, 4. Eddie Strada 343, 5. Matt Janisch 335.